The ability to shrink laboratory-scale processes to automated chip-sized systems would revolutionize biotechnology and medicine. For example, inexpensive and highly portable devices that process blood samples to detect biological agents such as anthrax are needed by the U.S. military and for homeland security efforts. 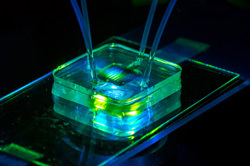 One of the challenges of lab-on-a-chip technology is the need for miniaturized pumps to move solutions through micro-channels. Electroosmotic pumps (EOPs), devices in which fluids appear to magically move through porous media in the presence of an electric field, are ideal because they can be readily miniaturized. EOPs, however, require bulky, external power sources, which defeats the concept of portability. But a super-thin silicon membrane developed at the University of Rochester could now make it possible to drastically shrink the power source, paving the way for diagnostic devices the size of a credit card. Up until now, electroosmotic pumps have had to operate at a very high voltage - about 10 kilovolts, said James McGrath, associate professor of biomedical engineering. Our device works in the range of one-quarter of a volt, which means it can be integrated into devices and powered with small batteries. McGrath's research paper is being published this week by the journal Proceedings of the National Academy of Sciences.